In the wake of the 2007/8 crash, finance including credit, debt and all forms of money became a subject to draw the attention of very many writers. 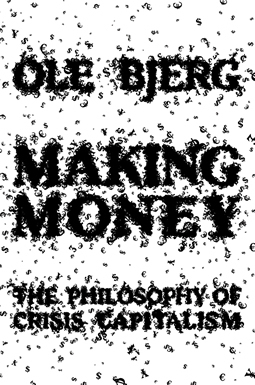 Ole Bjerg joins the throng, drawing inspiration from a select group of authorities using some borrowed philosophical concepts to explore the nature of money. In estimating the wisdom in Making Money, the philosophy of crisis capitalism, it may already be enough to know that Martin Heidegger, the first claimed authority, was an enthusiast for the Third Reich. A closer, critical examination does pay dividends for those willing to penetrate the depths of radical conservatism. Bjerg’s method of describing, interpreting and analysing the historical and logical background to the recent tumultuous events in the world of finance uses techniques akin to the magician’s sleight-of-hand. These are meant to direct and hold the reader’s attention, ensuring that it is drawn to and remains firmly fixed on the “fantasmatic” and the “Being of money”, detached from any connection with the production of things – goods and services – of value . Throughout his journey, Bjerg invokes the work of Slavoj Žižek (described variously by a fellow train-traveller whilst writing this review as “entertainer”, “comedian”, or “clown-philosopher’”) and his drawing on the three-part system of concepts taken from psycho-analyst Jacques Lacan – the real, the symbolic and the imaginary. For Bjerg, Žižek’s trilogy can be used to analyse whatever you choose, and here, “the Real” is money. Seizing on the idea that symbols are “all there actually is” is fundamental to the approach which also depends on and feeds the insistence that the industrial capitalism which ruled when Marx was alive and writing has been left behind by the present day world of finance. Bjerg acknowledges that the volume of production pouring out of today’s factories exceeds that of the 19th century by a very great margin, but never mind, the two billion or so people drawn into low-wage employment producing surplus value for the globalising corporate behemoths don’t even get a mention. Bjerg’s fantasmatic world of financial symbols conveniently ignores that kind of reality enabling him to allege that whatever might have been the case for the production of value in Marx’s time no longer applies. The 19th century class struggle has, it seems, been supplanted by a new opposition uniting debtors and creditors and “post-credit money”. The possibility that this new relation has served to deepen and intensify the exploitation of labour rather than replace it, is ruled out by the adoption of the Heideggerian concepts and the Lacanian trilogy. To fulfil his mission, Bjerg is obliged to take on and attempt to refute not just Marx, but many others using a variety of techniques including misdirection, downright confusion and selected partial misquotes. Berg’s method prevents us from examining, let alone understanding anything about the chain of causality behind either the 1971 breakdown of the post-war Bretton Woods arrangements, or the much more recent crash of 2007-8. If, as he says, “the Bretton Woods breakdown signifies the ultimate end of commodity money and the incarnation of pure fiat money” we’re surely entitled to ask what the cause of the breakdown was. "The credit system appears as the main lever of over-production and over-speculation in commerce solely because the reproduction process, which is elastic by nature, is here forced to its extreme limits, and is so forced because a large part of the social capital is employed by people who do not own it and who consequently tackle things quite differently than the owner, who anxiously weighs the limitations of his private capital in so far as he handles it himself. This simply demonstrates the fact that the self-expansion of capital based on the contradictory nature of capitalist production permits an actual free development only up to a certain point, so that in fact it constitutes an immanent fetter and barrier to production, which are continually broken through by the credit system. "Hence, the credit system accelerates the material development of the productive forces and the establishment of the world-market. It is the historical mission of the capitalist system of production to raise these material foundations of the new mode of production to a certain degree of perfection. At the same time credit accelerates the violent eruptions of this contradiction — crises — and thereby the elements of disintegration of the old mode of production. "The two characteristics immanent in the credit system are, on the one hand, to develop the incentive of capitalist production, enrichment through exploitation of the labour of others, to the purest and most colossal form of gambling and swindling, and to reduce more and more the number of the few who exploit the social wealth; on the other hand, to constitute the form of transition to a new mode of production." What drives Berg, his underlying motivation, is evident in his assertion that the “financial crisis could have been an occasion to rethink and revise contemporary capitalism”. Radical? Yes, but it’s a determinedly conservative kind of radicalism intent on preservation rather than replacement or supersession.